When researching the history of Lashbrook it is complicated by the fact that there are two places of the same name in this area. 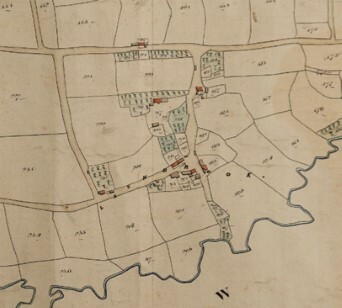 In a publication of 2001 which shows Historic Parishes of England and Wales before 1850, the use of the name Little Lashbrook is clearly shown despite the fact that it appears to be the larger of the two settlements. Other maps of around this time do not, however, call it Little Lashbrook! If we look back as far as the Domesday Book of 1086 the Lashbrook referred to there seems to be the Bradford one. At that time it was quite large with 26 households compared with Thornbury’s 19, Week’s 6 and Wonford’s 4. Cookbury had 21 and Bradford 13. Assuming that the experts on the Domesday Book have got this right, we can only assume that for some reason the population of that Lashbrook dwindled, possibly at the time of the Black Death. So back to our Lashbrook, where confusion continues, but this time over the name of the properties. The names used below are how they are now known. In the 1839 Tithe Apportionment document there seem to be 7 occupied properties, more or less the same as today. The names that appear at that time are Hearn, Priest, and Johns. There were also Sluggetts, Leys and Sanders and all of them intermarried. Lashbrook Farm, was occupied by the ill-fated Hearn family, (6 of whose children died from diphtheria) until sometime between 1891 and 1901, as by 1901 William Paige and his family were there. His son James Hamilton Paige married Margaret Chidley and his daughter, Monica married Stanley Gilbert, and they are the parents of the current owner Roger Gilbert. Lashbrook has been known as Little Lashbrook and Chapples Lashbrook. 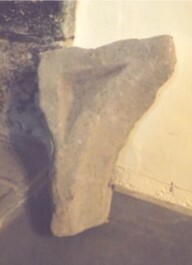 This latter is taken as evidence that there was once a Chapel in the hamlet and a piece of stone window tracery found in the wall of the farmhouse may be evidence of this. I have sent a photo of this stone to the museum curator in Barnstaple for an opinion on the age and likely source of this stone. 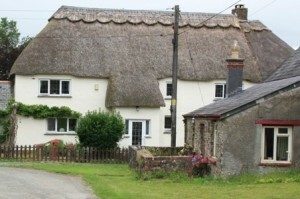 The building itself is a Devon Longhouse with evidence of the original cross passage still present. Originally the house would have had living quarters on one side of this passage and the Shippon on the other. The Priest family occupied Lashbrook from at least 1830 when, according to the Rent Book of that year, John was there with his family. His descendants occupied it until the 1970s when it was sold. Little Lashbrook is reputed to be the oldest property in the hamlet and is also a Longhouse although modernisation makes this harder to see but the evidence is still present. The main occupants of this house were the Johns family although the land was owned by Hugh Brent from Shebbear at the time of the Tithe Apportionment in 1839. Samuel Johns was born in West Putford in 1787 and came to Lashbrook with his family some time prior to 1841. Over the years he increased his acreage so that it rose from 16 acres in 1851 to 30 acres by 1881. John took over the farm from his father between 1871 and 81 and he is still farming in 1911 aged 74; he eventually dies in January 1917 aged 80. His son William eventually sold the farm in 1939 and then moved to the bungalow Four Winds on the lane leading into Lashbrook. There are various tales about the ‘goings-on’ in Lashbrook, including gambling over the ownership of fields which could pass from one person to another on a turn of the card or throw of a dice. This is one reason why the green lanes around the hamlet are so important as they enabled people to get to their land which was often quite fragmented. Lashbrook relied on a well until 1953 when mains water came to the hamlet. Apparently there was some resistance for a while but people soon got used to the convenience although the well is still there and used for livestock watering.